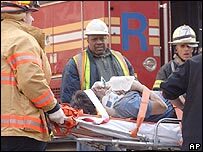 Rescuers in New York have been searching for survivors in the rubble of the apartment blocks crushed when a construction crane toppled into them. 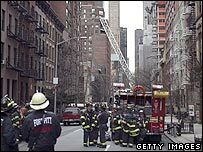 At least four people were killed in the accident and 10 injured, Mayor Michael Bloomberg has said. He told reporters that three of the injured were in a serious condition. He said the collapsing crane - which had stood 19 storeys high - "basically just flattened" an apartment building on Manhattan's Upper East Side. "It's a horrible situation, very gory. There's blood in the street," said Lieutenant Governor David Paterson, who is set to replace outgoing Governor Eliot Spitzer on Monday. Mr Bloomberg described the incident as a "tragic event" and said the crane had broken during a routine operation to extend its height, by inserting a section and raising its top part. "This accident is one of the worst the city has had," Mr Bloomberg said. "Our thoughts go to the families. I hope we will not find other victims." Witness Greta Welkhammer told local TV station NY1: "Everybody was running, running. It was devastating." The crane "literally split in half", she said. John LaGreco, who owns Fu Bar in the crushed low-rise building, told the Associated Press that he had been lucky to escape the accident. "Our bar is done," he said. "The crane crashed the whole building. If I wasn't watching a Yankees game, I would've come to work early and gotten killed." The collapse also overturned and crushed cars, left rubble piled high and caused a huge dust cloud to rise over the neighbourhood. Firefighters with sniffer dogs were scouring the rubble for signs of further victims. Fire Commissioner Nicholas Scoppetta said the search was "a painstaking hand operation, as we try to remove the rubble so we don't cause further collapse or injure anyone who may still be in that building". Stephen Kaplan, an owner of the Reliance Construction Group, told AP the company had contracted the work out to another company and described the incident as "an absolute freak accident". He said a piece of steel fell and sheared off one of the ties holding the crane to the building, causing it to detach and topple. Residents of the area reported hearing a loud roar as the crane came down. "First I heard a rumble, and it increased, and then it increased," said Bill Reilly, who lives nearby. "It continued building in strength... it shook the six-storey brick building that I live in." Maureen Shey, who lives opposite the under-construction building from which the crane fell, said: "I heard a big crash, and I saw dust immediately. Bricks were flying through the air. "I saw the whole thing. I thought the crane was coming in my window." The crane missed her building.